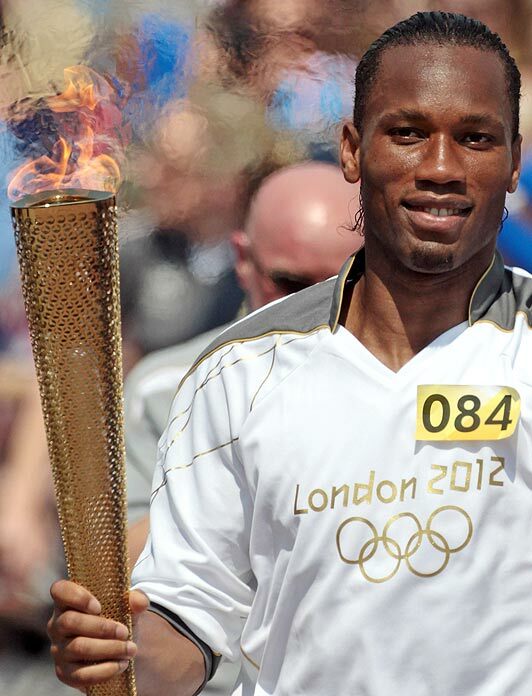 Chelsea star Didier Drogba carries Olympic torch - Integration Through Media ....! LONDON (AP) Thousands cheering for Chelsea star Didier Drogba have mobbed the Olympic torch relay route in southwest England, hoping to get a glimpse of the Ivory Coast striker as he carried the flame. Many fans, some wearing Chelsea blue jerseys, cheered as their soccer (football) hero ran through the center of Swindon on Wednesday. The 34-year-old waved as he trotted along with the torch. Drogba announced on Tuesday that he was quitting Chelsea, just days after scoring the winning penalty shot in the club’s dramatic Champion’s League final win over Bayern Munich. He is pursuing a career elsewhere. The British media have reported that Drogba’s next move will take him to China, but he hasn’t confirmed that.